We grow wine on the historic Abbott Taylor Farmstead, whose farmhouse and oldest barn date to 1811. 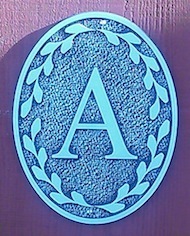 Both buildings are of hand-hewn oak likely felled on this farm, each structure joined by mortise and tenon, and proudly bearing distinctive pewter “A” plaques from the Alexandria Historic Preservation Commission. The farmstead is eligible for both the state and the national Registers of Historic Places because it is one of the very few remaining in New Jersey that has been continuously farmed for over 200 years. 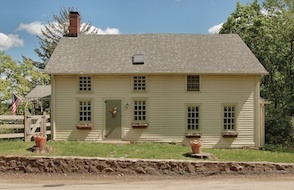 Our early federal period farmhouse, an “eyebrow colonial”, was designed to be adaptable as were most of the period. The left half is the 1811 original, whereas the right half was added circa 1836. Additional expansion occurred in 1960. We began restoring it in 2000. 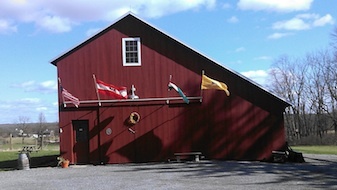 What is now our Wine Barn is another example of early American craftsmanship, also dating to 1811. On the eve of its 200th birthday, when it was a bit rough around the edges but with beautiful bones, we decided to restore it for use as our winery. With the help of the superb craftsmen at Herman S. Grefe & Son, we moved it from its original location on the corner of Mount Salem Road and Whitehall Road to be closer to the vineyard. Two months were spent preparing the barn to move, twenty minutes to move it, and another three months to completely restore it. As an energy-efficient, climate controlled agricultural building, this restoration earned the 2011 Donald B. Jones Award for historic preservation by the Hunterdon County Planning Board. 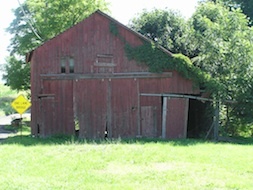 This barn was the oldest of three on the original farmstead, and it weathered far better than the younger two, of which only one still stands. A slide show of the move can be seen here.